I’m not the guy you normally go to about this because I usually call BS on all the complaints people have about certain foods that we buy. I mean come on, I’ve been using Sweet N Low and Equal since I was a teenager and I’m still alive. Whenever I say on social websites like Facebook that I’m eating or drinking something, there are at least 3 people telling me that I could get cancer and die. Yeah okay, whatever you say. So I just stopped. Today I was at the store and I saw they had a sale on Yoplait. I don’t normally buy yogurt because I cannot stand the taste of regular yogurt. I mean, it’s repulsive to me. I can remember the first time I ever tasted yogurt. I was 9 and my sister was eating yogurt and told me I should try it, so she gave me a taste and it was so awful that I literally vomited right where I stood. They say your taste buds change over time and to be fair that was in 1979, but believe me, nothing has changed. Yoplait is the only yogurt that I can eat that doesn’t taste like sour crap to me. The sale on the Yoplait was 10 for $5. I noticed they had pumpkin pie flavor so I bought 4 of those and then 6 other flavors. When I got home, I ate one of the Pumpkin Pie flavors and OMG It tasted just awful. I didn’t notice this label at first. If I had noticed that and then read the back to see what they replaced it with, if I saw Sucralose, I wouldn’t have bought it. Sucralose is Splenda and Splenda does some nasty stuff to me. Splenda gives me the worst stomach cramps I have ever experienced in my entire life. I mean so bad that I have put a heating pad on my stomach and one time I almost called 911 because the pain was so bad. I’ve tried ibuprofen and that didn’t even help. I would sit on the toilet until something came out, but afterward it still gave me cramps. I learned my lesson after the 2nd time this happened and I refuse to buy anything with Splenda in it. I can’t even have 1 simple cup of coffee with Splenda in it. The one thing that shocked me about Splenda, besides the fact that they make it by reacting sugar with chlorine, was that it is detrimental to patients with Cancer, AIDS and heart patients. The Better Health Store website and a couple other sources say this. I find that extremely shocking because of the fact that since January of 2013, I have been eating nothing but diet food. I lost 70lbs last year because of it. I am still eating diet food because I am still trying to lose weight. Well, I don’t think anything had Splenda in it, but how do I know that for sure? I’m not looking to blame anyone, but I have AIDS and according to most of my blood tests this year, my viral load has gone up. It has been undetectable for nearly a decade, and then all of a sudden it goes up and no one knows why? I take my medication religiously. I don’t even miss a day, and if I notice at 2pm that I forgot to take my morning pills, I will take them immediately. I don’t mess around with my health. These medications are keeping me alive, and if I am eating or drinking something with Splenda in it and it causes my medications to fail, well I have a problem. Many people recommended Stevia, but that does the same, if not worse. The first time I tried Stevia, I was in the bathroom within minutes of drinking my first cup of coffee with it. I mean immediately. My stomach was cramping up so much and it gave me the worst gas I’ve ever experienced. I think I was on the toilet for 30 straight minutes crying in pain. It was just awful. Look I’m all for trying new things, but I have health issues and I have to continue to use what works for me. I have never had any problem with Equal also known as Aspartame, even though the CPSI website does not recommend it, or Sweet N Low also known as Saccharin. Someone recommended Monk Fruit to me tonight, and this website says it’s safe, but it also says that about Stevia and well, my body does not like that either. I won’t reject someone’s recommendation without at least giving it a try, but I also don’t want to over pay for something that I may have to throw in the garbage. So my recommendation is if you have cancer, AIDS or have a heart problem, avoid Splenda like the plague if you want your medication to work. If you like Stevia and it doesn’t give you trouble then use that. But please don’t tell me what I should and should not try because I have a reason for doing the things that I do. 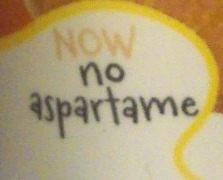 Oh and companies, take notice that the Splenda you are using in your products are harmful to people like me. Which would you rather have, a happy customer, or a dead customer?